RAS genes acquire the most common somatic gain-of-function mutations in human cancer, and almost all of these mutations are located at codons 12, 13, 61, and 146. We present a method for detecting these K-RAS hotspot mutations in 228 cases of colorectal cancer. The protocol is based on the multiplex amplification of exons 2, 3 and 4 in a single tube, followed by primer extension of the PCR products using various sizes of primers to detect base changes at codons 12, 13, 61 and 146. We compared the clinicopathological data of colorectal cancer patients with the K-RAS mutation status. K-RAS mutation occurred in 36% (83/228) of our colorectal cancer cases. Univariate analysis revealed a significant association between K-RAS mutation at codon 12 of exon 2 and poor 5-year survival (p = 0.023) and lymph node involvement (p = 0.048). Also, K-RAS mutation at codon 13 of exon 2 correlates with the size of the tumor (p = 0.03). Multivariate analysis adjusted for tumor size, histologic grade, and lymph node metastasis also indicated K-RAS mutations at codon 12 and 13 of exon 2 correlate significantly with overall survival (p = 0.002 and 0.025). No association was observed between codon 61 and 146 and clinicopathological features. We demonstrated a simple and fast way to identify K-RAS mutation. The RAS genes encode a family of GTPases that act as signal switch molecules for many important cellular processes. Common in human cancers, activating ras mutations cause the deregulation of ras protein activity, which results in the loss of GTPase activity and the gain of oncogenic activity [1–7]. In fact, RAS genes are the genes that most commonly show somatic gain-of-function mutations in human cancers [8, 9]. There are three cellular RAS genes, encoding the K-ras, H-ras and N-ras proteins, and all show activating mutations in human tumors. Of the three RAS genes, K-RAS is the most frequently mutated, which makes it an ideal target for cancer treatment [9, 10]. Meanwhile, K-RAS mutation plays an important role of the response rate of anti-EGFR antibodies treatment for patients with metastatic colorectal cancer [11, 12]. RAS point mutations are highly prevalent in human cancers and mostly occur in codons 12, 13 and 61. These mutations render the ras proteins insensitive to GTP-induced hydrolysis of GTP to GDP and lock them in the activated state [2, 8, 9]. Mutations in codons 10, 11, 15, 18, 19, and 22 have also been reported, but their biological significance is unclear [13–18]. Several methods have been developed for detecting K-RAS mutations [19–26], but these methods do not simultaneously recognize all base changes at codons 12, 13 or 61 of K-RAS. Somatic missense mutation at codon 146 were found in three independent studies of colorectal cancers from Hong Kong and the United States, and it was suggested that these mutations may make an equal or greater contribution to colorectal cancer than the codon 61 mutation [27–29]. Direct sequencing of exons 2 and 3 can recognize the base changes in codons 12, 13 and 61. But, codon 146 which is located at exon 4, is too far apart (19,771 base pairs) from exon 2 to be sequenced in a single reaction. In this study, we employed a method to simultaneously detect the base changes in codons 12, 13, 61 and 146 of K-RAS in a single tube and establish their clinical significance in colorectal cancer. We designed primers adjacent to codons 12, 13, 61 and 146 of the K-RAS gene, as these are the most common mutations in cancer. For mutation analysis of codons 12 and 13, we used different-sized primers (sense strand) to recognize the change of the first base separately, and we designed antisense strand primers to detect the change of the second base of the codon to avoid interference between primers of the same direction. We did not design primers to detect change at the third base of codon 12 or 13 because these mutations do not result in the change of the amino acid. For the analysis of codon 61, we designed three different-sized primers (sense strand) to distinguish changes in the first, second, and third bases separately. The primers were made to be different in size either by adding different lengths of poly(dT) tails to the 5'-end or extending the primer sequence in order to allow for separation based on the differences in size. First, we analyzed codon 12 mutations using a 20mer sense strand primer to detect the first base changes of codon 12 and a 29mer antisense strand primer to detect the second base changes of codon 12. To the tube with codon 12 primers, we added two more primers to detect the base changes at the first and second bases of codon 13 (41mer sense strand for the first base; 49mer antisense strand for the second base). The results suggested that the primers worked well in spite of the fact that the primers used to detect the first or the second base changes of codons 12 and 13 are of the same direction, suggesting that these primers do not interfere with each other. The extended products were analyzed on the Beckman Coulter automatic sequencer in a 17-minute run, and all the base changes of codons 12 and 13 were detected. These results indicated that the direction of the primer do not play an important role in detecting the base changes at a given codon. We then used different-sized primers of the same direction (sense strand) to recognize the first and the second base changes separately, and all the base changes of codons 12 and 13 were detected. We also used degenerate probes (containing a degenerate base at the last base of the probe to detect the second base change of codon 12 or 13) and they also worked well (data not shown). After this preliminary study using four probes to detect codon 12 and codon 13 mutations, we added five more probes to detect codon 61 and codon 146 mutations. This collection of probes defines our multiplex PCR and primer extension method for codons 12, 13, 61, and 146. We then used our multiplex PCR and primer extension method to assay 228 cases of colorectal cancer. The results showed that 83 cases have K-RAS mutations in the hotspots that we screened. Of the 83 mutant cases, there were 58 cases of codon 12 mutations including 7 cases of GGT→TGT, 3 cases of GGT→AGT, 18 cases of GGT-GTT, 29 cases of GGT→GAT and 1 case of GGT→GCT. There are 21 cases of codon 13 mutations, including 1 case of GGC→CGC and 20 cases of GGC→GAC. There was one example showing a mutation of codon 61 (CAA→CAT), and there were three cases of codon 146 mutations, all of which were of the GCA→ACA mutation. The mutations in all of these cases were heterozygous. We next determined the minimal amount of DNA required for reliable mutation detection. We diluted DNA samples harbouring codon 12 and 13 mutations, and analyzed the samples as described above. For each of the mutations, we found that 10 ng of DNA was enough for the multiplex PCR reaction. We subsequently determined the lowest concentration of mutant DNA in a background of normal DNA needed for mutation detection. We mixed tumor DNA (heterozygous for the mutation at codons 12 and 13) with control DNA in different ratios (1:3, 1:13 and 1:20) (Fig. 1). The result showed that this method can detect K-RAS mutations in a DNA mixture containing as little as 5% mutant DNA. 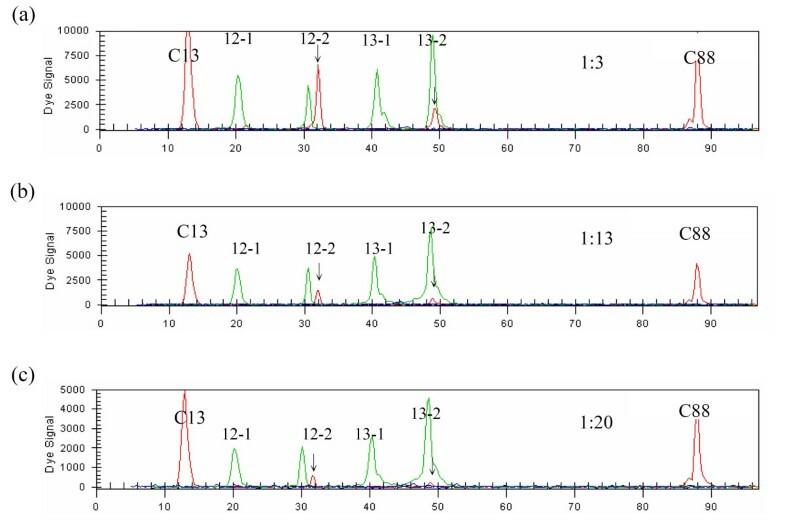 Determining the sensitivity of multiplex PCR and primer extension analysis of K-RAS mutation by serial dilution of the samples. Upper (a), middle (b) and lower (c) panels are 1: 3, 1: 13 and 1: 20 dilution, respectively. We used direct sequencing to analyze the mutations of the K-RAS gene in the coding and intron-exon junction regions of exons 2, 3, and 4. As expected, the results showed hotspot K-RAS mutation in 83 of the 228 cases. The results of sequencing analysis were identical to the results of multiplex PCR with primer extension analysis. There were no compound heterozygous mutations or homozygous mutations in any of these cases, and the mutational frequencies of codons 12, 13, 61, and 146 were 25.4%, 9.2%, 0.4% and 1.3%, respectively. We did not find any other mutations, such as mutations at codons 10, 11, 15, 18, 19 or 22. We can therefore conclude that our method was very accurate in profiling the mutations in colorectal cancers, and will detect the majority, if not all, of the K-RAS mutations commonly seen in cancer. We compared the clinicopathological data of colorectal cancer patients with the mutational status of K-RAS in their cancerous tissues. The univariate analysis revealed that there is a significant association between K-RAS mutation at codon 12 of exon 2 and poor 5-year survival. This mutation also serves as a good indicator of lymph node involvement in this disease (Table 1). Furthermore, K-RAS mutation at codon 13 of exon 2 correlates with the size of the tumor (>3 cm, p = 0.03). In the multivariate analysis which incorporated independent prognostic factors of tumor size, histologic grade, and lymph node metastasis, we found that K-RAS mutations at codon 12 and 13 of exon 2 were both significant with regard to overall survival (p = 0.002 and 0.025) (Table 2). Lymph node involvement also correlates significantly with overall survival (p = 0.001). No association was observed between codon 61 and 146 and clinicopathological features. Resected primary colorectal cancers were obtained from 228 patients in Changhua Christian Hospital. All the cases were adenocarcinomas and were classified as "poorly-differentiated" to "well-differentiated". All patients were staged according to the 2002 American Joint Committee on Cancer staging system . The tumor specimens were frozen immediately after surgical resection and stored in liquid nitrogen until DNA was extracted. The age of the patients ranged from 36–72 years with a mean of 49 years. This study was approved by the Institute Review Board of Changhua Christian Hospital. DNA extraction was performed as previously described . Three pairs of primers were used to amplify the exon-intron junctions and coding regions of exons 2, 3, and 4 of the K-RAS gene (see Additional file 1). The PCR was performed with a denaturing step at 94°C for 5 min, then 30 sec at 94°C, 30 sec at 56°C, and 1 min at 72°C for 35 cycles, followed by a final 5 min at 72°C. The PCR products were visualized on a 2.5% agarose gel. These PCR products were then subjected to direct sequencing using the same primers, and all mutations were confirmed by sequences originating from both the upstream and downstream primers. Direct sequencing was performed on a Beckman Coulter CEQ 8000 Series Genetic Analysis System (Beckman Coulter Inc., Fullerton, CA, USA) according to manufacturer instructions. Multiplex PCR was used to amplify exons 2, 3 and 4 of K-RAS gene in a single tube. The primers used for the multiplex PCR were identical to those used for the direct sequencing analysis. 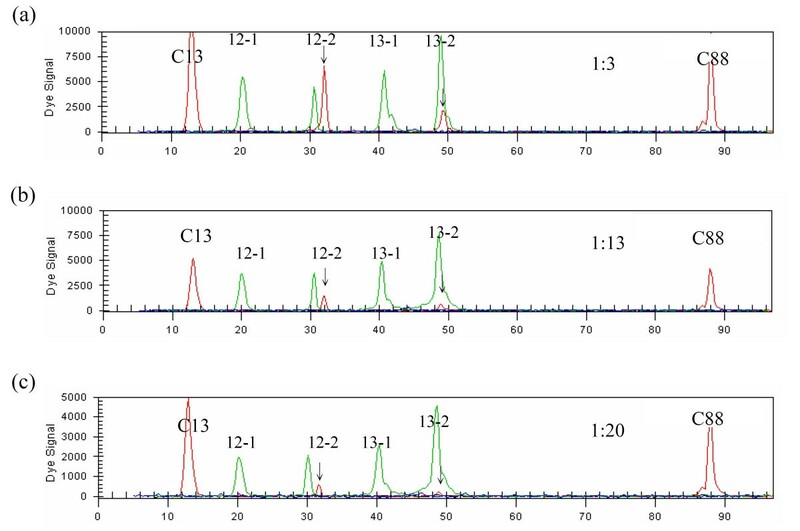 After multiplex PCR amplification, the PCR products were purified to remove the remaining primers and unincorporated deoxynucleotide triphosphates, using the PCR-M™ Clean Up System (Viogene-biotek Co., Sunnyvale, CA, USA) or a simple treatment with exonuclease I and shrimp alkaline phosphatase. After removing the primers, the products were subjected to primer extension analysis. The primers ranged from 20–65 bases, and most probed the sense strand (see Additional file 2). The exception was when there were adjacent mutations; in this case both sense and antisense strand primers were used. Degenerate bases were used in the primers to identify adjacent mutations. Various concentrations of probe for either codon 12, 13, 61 or 146, were added to the tube containing purified PCR products, as well as 4 μl of SNPStart Master Mix (Beckman Coulter Inc., Fullerton, CA, USA) containing Taq DNA polymerase and fluorescently labelled ddNTPs. Each 10-μl mixture was subjected to 30 single-base extension cycles consisting of a denaturation step at 90°C for 10 sec, and primer annealing and extension at 55°C for 20 sec. After cycle extension, unincorporated fluorescent ddNTPs were incubated with 0.25 μl of shrimp alkaline phosphatase (SAP) (United States Biochemical Co., Cleveland, USA), 1.3 μl SAP buffer, and 1.45 μl ddH2O at 37°C for 30 min, followed by enzyme deactivation at 65°C for 15 min. Comparison between clinicopathological features and status of K-RAS mutation in colorectal cancers were analyzed by Chi-square test or Fisher's exact test. Independent prognostic factors were analyzed by the Cox proportional harzards regression model. Variables in the model included tumor size, histologic grade, and lymph node metastasis. A P value of less than 0.05 was considered statistically significant. We thank Shu-Hui Lin for technical advice. This study was supported by the National Science Council of Taiwan (NSC-95-2320-B-037-050-MY3), a grant from Changhua Christian Hospital, and a grant from Kaohsiung Medical University Hospital. YSC performed the experiments and drafted the manuscript. KTY helped to design the study. TJC and NCH participated in the statistical analysis. CC helped to design the study. HCL participated in the coordination of the study. JGC design the study. All authors read and approved the final manuscript.